Editor’s Note: By all accounts, the Federal Reserve ended its bond buying program, known as quantitative easing, at its policy meeting at the end of last month. Over six years, the central bank bought $4.5 trillion worth of mortgage-backed securities and Treasury bonds. But since the beginning of this year, the Fed has been gradually drawing down its purchases by $10 billion a month to now, zero. It’s not that simple, though, says economist Terry Burnham. The Fed is continuing what he calls “Stealth QE,” or the purchase of more bonds with the interest the Fed earns on the bonds it has already purchased. In order to stop that, he writes, the Fed would need to shrink its balance sheet by the amount of interest that it earns. Burnham, a long-time critic of the Fed’s bond-buying program, is a former Goldman Sachs trader, biotech entrepreneur, money manager and economics professor at Harvard’s Business School and Kennedy School of Government. He now teaches at Chapman College. A frequent contributor to this page, he’s most famous for his prediction that the Dow will hit 5,000 before it hits 20,000. Oct. 29, 2014 marked the end of the Federal Reserve’s historic program of quantitative easing, or QE, which created more new money in the past six years than in the entire history of the Republic. Easy-money has caused the U.S. stock market to soar. Beginning in December of last year, the Fed gradually retreated from its monetary generosity by tapering its purchases of Treasury and mortgage bonds to the point that quantitative easing is, at long last, now over. The preceding paragraph reflects the conventional wisdom; the global financial media have printed hundreds of similar paragraphs over the last few months. What’s false? QE is over. And what’s misleading? The monetary tightening of the QE “taper’ was gradual and has ended. And the myth? 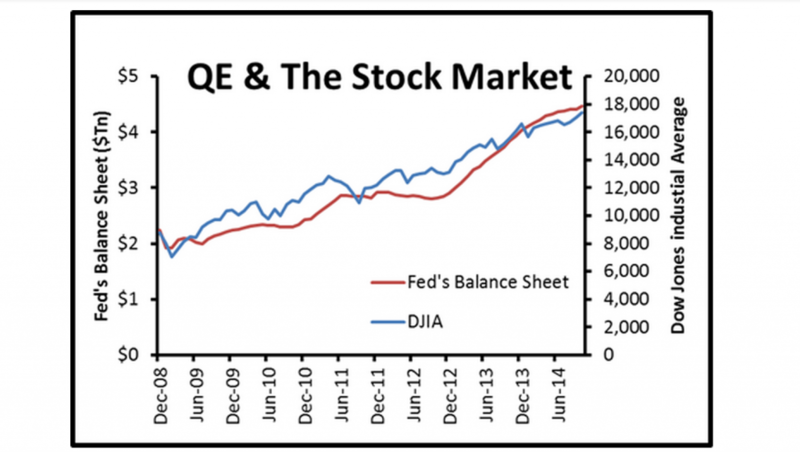 QE causes the stock market to rise. Image courtesy of Terry Burnham. We are in the midst of an historic macroeconomic experiment. The U.S. government is pursuing three highly unusual policies: creating extra money, holding interest rates low, and spending far more than it collects. (Read my piece “The Dow may be above 17,000 but not for long” to understand the historic nature of current policies). Imagine the termination of these macroeconomic policies as economic hurdles, which, if cleared without stumbling, could lead to a robust economy and further stock market gains. Under quantitative easing, the Federal Reserve has purchased almost $4.5 trillion in Treasury and mortgage bonds. The Fed uses electronic money that it creates from nothing to make these purchases. To say that QE has been unprecedented is to understate the case, as the Fed bought less than $1 trillion in bonds between its creation in 1913 and the start of QE in 2008. If you put your money in a standard “interest-bearing” bank account you will earn $0 in interest. This is because the Federal Reserve controls a key, short-term interest rate, known as the Fed Funds rate. Short-term rates of all kinds are low because they have been influenced by the Fed’s zero interest rate policy. By comparison with the current 0 percent, the post World War II average for the Fed Funds rate is 5.2 percent. The U.S. federal government has added $10 trillion in additional debt in the last decade. This more than doubles the $8 trillion accumulated in the entire history of the country. The combination of loose money and massive federal spending has never before occurred in the U.S., not even during the 20th century’s two World Wars or the Great Depression. The end of QE will be important for two reasons. First, it will begin the process of unwinding these unusual policies — a significant event in itself. And second, it will be momentous precisely because no one knows what will happen. With this backdrop, let us return to the falsehood, misconception, and myth contained in QE conventional wisdom. These headlines proclaim QE done and gone. But they’re wrong. “Stealth QE” continues. Stealth QE is the purchase of more bonds with the interest the Fed earns on the bonds it has already purchased. The Fed earns about $100 billion a year in interest on its holdings. But in its recent statements, the Fed is silent about these interest payments. For example, the Oct. 29, 2014 FOMC statement — the one announcing an end to the asset purchases program — includes, “The Committee is maintaining its existing policy of reinvesting principal payments from its holdings of agency debt and agency mortgage-backed securities in agency mortgage-backed securities and of rolling over maturing Treasury securities at auction.” The word “interest” is nowhere in the statement. But stealth QE occurs regardless of what the Fed does with the interest it earns. If the Fed reinvests the interest it earns to buy additional bonds, then QE continues directly in the standard manner with an increase in the Fed’s balance sheet. If the Fed does not reinvest the interest, it simply sends the interest to the U.S. Treasury. The U.S. Treasury will then issue fewer new Treasury bonds. In either case, the interest on the Fed’s current bond holdings decreases the supply of bonds in the market. In order to stop stealth QE, the Fed would need to shrink its balance sheet by the amount of interest that it earns. Alternate history headline: Federal Reserve begins MASSIVE bond buying program. Consider what would have happened in 2005, for example, If the Fed had introduced a $100-billion-a-year program to buy bonds. We would have seen headlines announcing the historic event. Former Rep. Ron Paul, and other elected officials, would have excoriated the Federal Reserve chair in public hearings. But now it’s 2014, and stealth QE isn’t likely to elicit much more than a yawn from the public because these ongoing purchases are so small compared with recent purchase amounts. However, stealth QE is massive compared to Fed purchases up through 2007. For the first 94 years of its existence, the Fed bought an average of under $10 billion in bonds per year. So stealth QE has Fed activity running at 10 times its historical average. Furthermore, stealth QE isn’t completely different in size from the second round of quantitative easing, begun in 2011. Under QE2, the Fed bought a total of $600 billion in additional bonds. It would take about five to six years for the Fed to amass that amount of bonds under stealth QE. So, QE has not ended. Stealth QE continues, and it is significant. Conventional wisdom argues that “taper tightening” began in December 2013 and is now over. Further monetary tightening, this thinking suggests, is on hold until sometime in 2015 when the Fed will likely raise the Fed funds rate for the first time since the crisis. But this view ignores the lag in monetary policy. The Fed believes, for example, that low interest rates stimulate the housing sector and create housing-related jobs. However, jobs that arise from low rates may be created months or years after an interest rate decline; it takes time for people to make a decision, close a mortgage, sell a prior home, etc. When it comes to monetary policy we must always consider the lags. In the case of QE, the lagged effects are important because the recent purchases of bonds under the program have been massive. On Nov. 12, 2014 the Fed’s balance sheet was $4.49 trillion, up $600 billion from a year earlier. Remember that the new bond buys in the past 12 months almost equal all Federal Reserve bond purchases between 1913 and 2007. There is a Mt. Everest-sized bolus of QE bond buys still working their way through the system with a lag. Because monetary policy operates with a lag, many of any tightening effects caused by the reduction in QE have yet to come. Depending on the length of the lag, we may be less than halfway through the taper tightening. The public has mixed feelings about QE. Gallup reports that only rich people have a favorable view of the Federal Reserve and former Chair Ben Bernanke. This may reflect the public’s belief that QE increases the stock market more than the real economy. Graph courtesy of the author. QE has been correlated with stock market gains. I believe, however, that any causal relationship is a myth. The first definition of myth in an online dictionary is, “a traditional or legendary story … with or without a determinable basis of fact.” Many people believe that QE supports the stock market, but there is no proof or disproof. 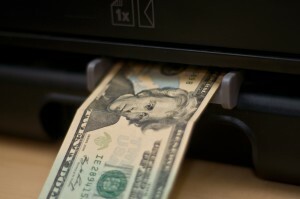 What is the relationship between quantitative easing and the level of the stock market? The mythical explanation is: With quantitative easing, the Fed buys more bonds from individuals and institutions. The sellers of these bonds receive cash from the Fed. Some of that cash gets re-invested in the stock market. These additional stock purchases cause the stock market to rally. The real world, however, may not work with mythical simplicity. While the stock market continues to exhibit a strong correlation with the Fed’s balance sheet, gold, oil and other commodities tell a different story. 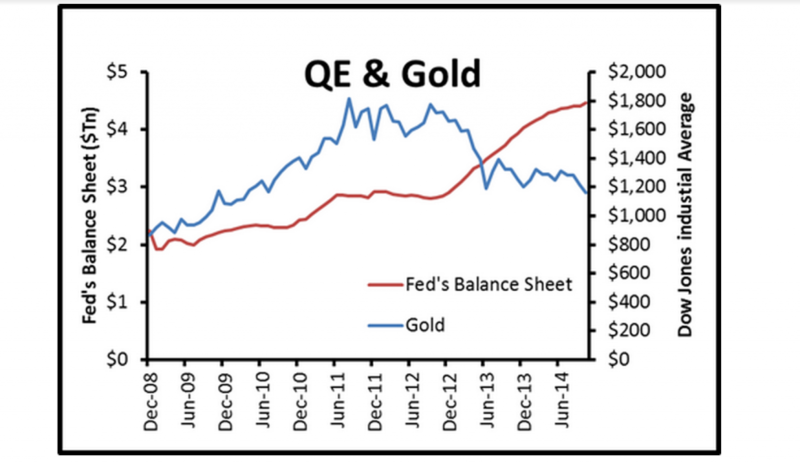 The argument that QE increases the price of gold works exactly the same as the one for stocks. Because of QE, investors have more cash in their accounts; some of that cash gets invested in gold, causing gold prices to rise. Beginning in 2011, however, gold prices and the Fed’s policy decoupled in a dramatic fashion. The Fed’s QE pace accelerated significantly yet gold prices plummeted. In rough terms, the Fed’s balance sheet has doubled while the price of gold has halved. Correlation is not golden causation. Looking beyond gold, other commodity prices, like that of oil, demonstrate the same decoupling from the Fed’s balance sheet. Again, the simple logic argues that more QE leads to commodity inflation. However, commodity prices have fallen broadly, and dramatically, during the Fed’s most aggressive phase of QE. Since 2011, the CRB index, a broad measure of commodity prices, has dropped by 25 percent. Gold, oil and other commodity prices were positively correlated with QE for years but fell dramatically even while the Fed was in the midst of a QE bond-buying bonanza. QE does not cause commodity prices to rise. Perhaps commodities are a special case, whose price declines are explained by increases in supply and a slowdown in China. Let us next consider Treasury bonds. In March 2011, Bill Gross, then leading PIMCO, predicted that bond prices would drop after the Fed ended QE2, the second round of bond purchases. What could be more obvious. Under QE2 the Fed had been a HUGE purchaser of Treasury bonds. When demand plunges, it is reasonable to predict that prices will decline. Financial markets are tricky because people set prices not economic models. 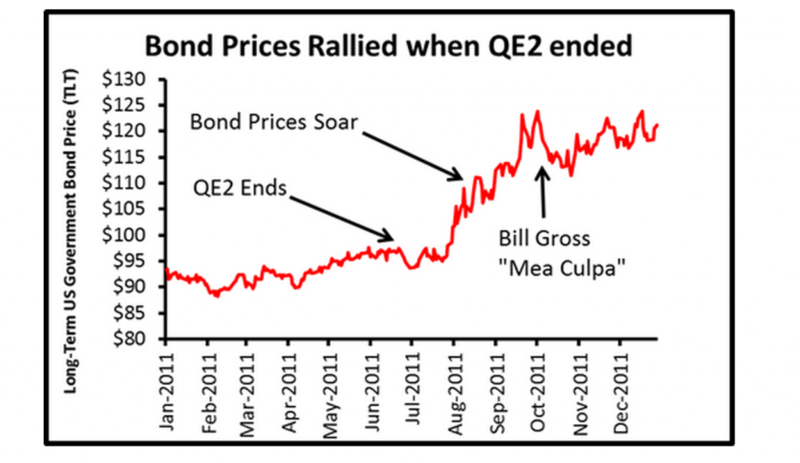 Bill Gross’s QE2 call was reasonable, but it turned out to be 100 percent wrong (the fallout from this 2011 situation continues today with the anointing of a new bond king, Jeff Gundlach, to replace Bill Gross). In summary, there is no simple relationship between QE and asset prices. Commodities, including oil and gold, have plummeted during the most sustained, aggressive phase of QE. Even bonds, the asset purchased by the Fed under QE, show no clear relationship with the Fed’s behavior. So that leaves us with one question. Does QE cause stock prices to rise? The logic that people use to explain a causal relationship between QE and stock prices does not work in other markets. We are left with no theory — just a correlation. Without a clear answer we are each free to come up with our own opinions. I believe that the idea that the Fed is supporting stock prices is a myth that will be dispelled over time as stock prices and the Fed’s balance sheet diverge. What will a divergence look like? Optimists believe that the stock market can continue to go up, even as the Fed dramatically slows QE. However, I continue to predict that the stock market will decline, and that this decline will persist even if the Fed restarts QE at even higher levels. We are in the midst of the greatest macroeconomic experiment in the history of the Republic. “The End of QE” is symptomatic of the fog in which we live. Even issues that ought be clear are surrounded by myth, misconception and falsehood. 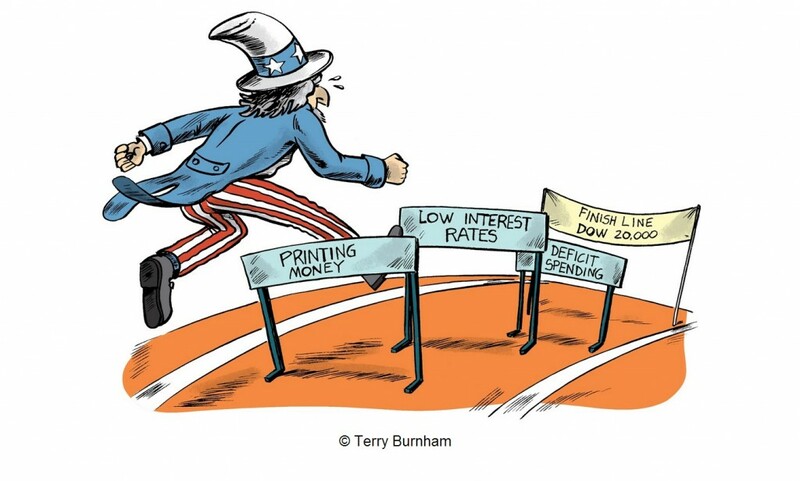 Left: The Federal Reserve is still engaging in what economist Terry Burnham calls "stealth quantitative easing." Photo by Flickr user Paul Nicholson. 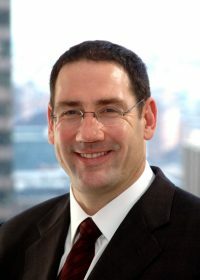 Terry Burnham is a former Goldman Sachs employee, money manager, biotech entrepreneur and economics professor at the Harvard Business School. He’s the author of “Mean Genes” and “Mean Markets and Lizard Brains” and now teaches finance at Chapman University. You can follow him at www.terryburnham.com.